Follow the Online Playgrounds Blog - Who should repair your playground equipment? Constant daily use means that there comes a time when playground equipment will get damaged and will need to be repaired. Even equipment that is designed and manufactured to the highest quality will eventually need to be repaired after years of withstanding children playing on it, so it is important to have plans in place about who will repair the equipment once damages happen. While some repairs will need to be carried out by playground equipment maintenance professionals, many can in fact be done by school staff. We’ve created this guide to help you determine which repairs can be safely carried out by members of staff and which ones need a professional. General maintenance of the equipment, for example monthly inspections or repainting fences, can be carried out by the school’s maintenance team. A lot of general maintenance of playground equipment will be done as part of overall jobs around the school and will be an ongoing daily and weekly part of the school schedule. Although general maintenance won’t involve repairing the equipment, it will often flag up any damage to the equipment that needs to be repaired or concerns about potential damage that needs to be kept track of to ensure that the equipment remains safe for children to use. As with general maintenance, minor repairs can be carried out by staff within the school. Minor repairs refer to small damages that need to be fixed in order to ensure that the equipment remains safe to use such as replacing pieces of damaged equipment, for example wing seats or safety surfacing. Normally these repairs are simple to do and can easily be done by the school’s maintenance team who will have the skills and tools needed to carry out the repairs. To ensure that the equipment remains safe for children to use it is vital to source high quality spares that are suitable for that specific piece of equipment. As well as this it is important to use the correct tools when fixing the equipment or else it could result in the equipment not being correctly repaired, the damage becoming more severe and potentially unsafe for children to use. When it comes to serious repairs they should be carried out by playground maintenance experts. Serious repairs usually involve major replacement of areas of the playground equipment, for example having to remove pieces of equipment so that a new type of safety surfacing can be installed. These types of repairs need to be carried out by experts as they normally involve complicated removal or fixing of the equipment that if not done correctly will involve it becoming unsafe for children to use. Another time playground equipment specialists need to be involved is when it comes to replacing old equipment with new alternatives. 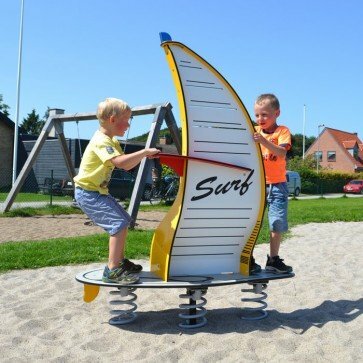 There are many playground equipment companies that not only provide equipment but who will also ensure that it is installed professionally. It is important to have equipment installed by professionals as if it is not installed correctly it will result in it being unsafe for children to use and could result in serious injuries from happening. When deciding whether playground equipment repairs can be carried out by someone within the school or if an expert is needed it is vital that children’s safety be considered. If there is any thought that school maintenance staff carrying out repairs could result in the equipment becoming unsafe to use or result in further damage it is important to get outside assistance with the repair process.